On March 7, 2015, the Andrews University APF Chapter, along with a number of other student organizations, sponsored an event which looked at the state and regional conference structure within the North American Division (NAD) of the Seventh-day Adventist Church. After a review of the NAD's organizational structure, panelists with ties to Andrews University answered a number of relevant questions. 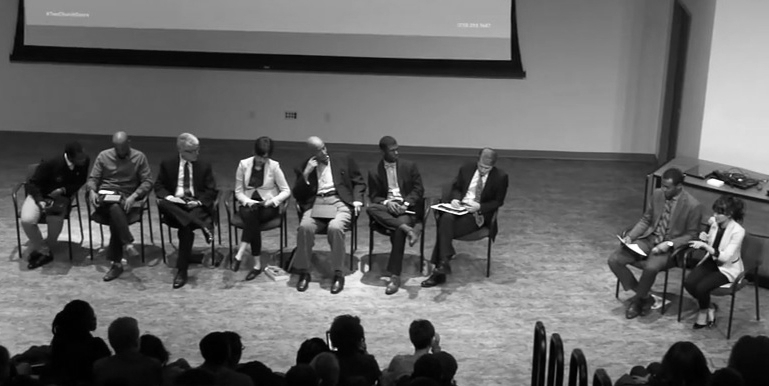 A video of the event can be viewed on YouTube--A Forum On State and Regional Conferences. In light of the national conversations surrounding race and race relations over the past year, we have become increasingly concerned about the lack of clarity regarding the administrative separation of our church conferences along racial lines in the North American Division. We understand that there are many strong and diverse opinions on this issue. Even within our own group, there are opinions as to whether restructuring should even be sought; and opinions regarding how restructuring could be appropriately accomplished. However, one thing on which we all agree is that the present structure seems peculiar. Without explanation, we worry about how it looks to the outside world. We worry about how it looks to us. Release an official public statement, to be passed at the North American Division Year-end Meeting in the fall of 2015, clearly explaining why we maintain the current organizational structure. This request is presented with the hope of reconciliation, in a spirit of deep regard for the sensitivity of this subject, profound respect for church order, and earnest desire for the advancement of God’s Kingdom through this unique Adventist movement. The statement is also available online here.